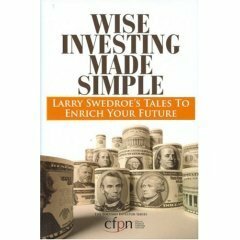 Recently, I was sent a copy of Wise Investing Made Simple: Larry Swedroe’s Tales to Enrich Your Future by the publicist. After I finished the first chapter, I simply couldn’t put it down until I finished the book. As my regular readers may know, I like good stories, and this book was packed full of great stories. Although it seems a little expensive at $24.95, I thought the book was worth its weight in gold. Third, it is important to be a disciplined, long-term, buy-and-hold investor. Overall, this is not a beginner book by any mean. I think people new to investing would find this book a little harder to grasp. However, this is the kind of book that reveals great insight to anyone that has basic knowledge about investing, as well as those that called themselves professional investors. @Don — Given that there are more years where the stock market rises than the ones where it declines, I still believe that indexing has great advantage over managed funds. I just finished this book and was convinced that Swedroe’s views on investing in index funds provided greater returns than most managed mutual funds. However, having done some research, I’m not so sure I agree with the premise of this book. It is a fact that the S&P 500 index has provided less than a 3% return over the last 10 years ending 8/08. Over this period, many managed mutual funds beat this number. Look at Fidelity’s domestic funds for example. In fact, you could have invested your money in a money market fund and earned around 3.5% with almost no risk beating the index by a point and a half. I think the academic investors who subscribe to the index theory tend to look at how many managed funds beat the market in a given year, and then look at how many of those beat the market the next year and so on. This doesn’t take into account that a fund manager could, and many have, lagged behind the index for a few years but outperformed the market a number of years by so much that in the final, let’s say 10 years, their AVERAGE gain over those 10 years has beaten the index. The problem is that it is difficult if not impossible to pick fund managers who will beat the market. I’m still not sure which way to go.